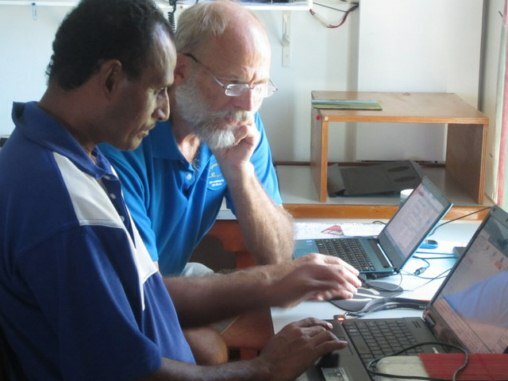 Nukumanu New Testament translation completed! (July 4th, 2013) While the USA celebrates their Independence Day, the Nukumanu translation team celebrates the completion of the translation of the New Testament. Round after round of checking finally came to a close when translator Edmond Teppuri made the final corrections and consultant Nico Daams approved them. During the last six months many significant changes have been made to the translation, both in spelling conventions, and more importantly, in some of the key Biblical terms, such as Son of Man and Kingdom of God. The Isles of the Sea typesetter, Paulus Kieviet, is now working with Edmond on getting the NT ready ready for the printer. Illustrations will need to be selected, maps will need to be provided with the Nukumanu names, and a hundred other small details need to be carefully looked at. The NT will be printed by New Life Literature in Sri Lanka, and then shipped back to Papua New Guinea. The dedication for this NT is tentatively planned for December this year.